At Greenville Motor Co, we provide roadside assistance and lock-out service when you need it most. We are available 24 hours a day, 7 days a week to assist you in those dire moments. Whether you've been in a car accident or just run out of gas, our team is here for you. For all your light and medium duty towing needs, leave it to us! Call us day or night and our wreckers will be on their way to get you out of any sticky situation. Our towing specialists will make you their first priority and assist you in a timely and professional manner. So, get the help you need today and contact us at (573) 776 5681. When you do business with us, you do business with a team of caring professionals. We do everything in our power to ensure that you get back on the road safely. At Greenville Motor Co, we don't feel you should have to spend an arm and a leg on towing services. That's why we offer competitive rates you can trust! Did we mention fast? Because we are! We don't want to leave our clients waiting for too long, so we make sure to get the ball moving quickly and efficiently! Towing You Can Depend On! When you need a tow, trust us to get to you fast! Rain Or Shine, We're Here For You! 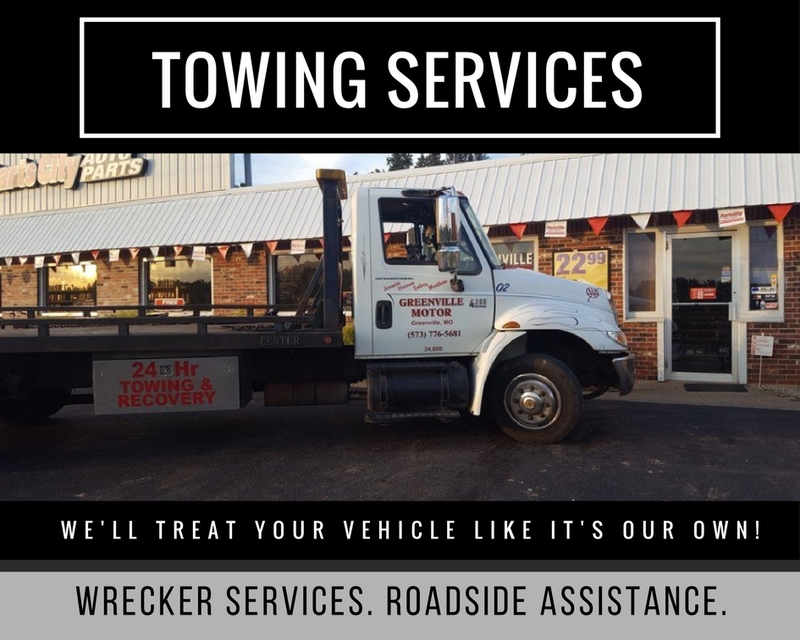 When you need a tow fast, trust us to get to you when you need us most! DON'T WASTE TIME STUCK ON THE ROAD! Being stuck on the road is a frustrating, and time consuming experience. It's a hassle that no one wants to deal with. Here at Greenville Motoro Co, we understand that you can't put life on pause while you wait for a tow truck, or roadside assistance. For light/medium towing service, fuel delivery, car unlocks, jump-starts, and IMMEDIATE assistance, your only choice is Greenville Motor Co. Our experienced staff will dispatch a truck immediately to your location. No matter the time, or situation, call Greenvile Motor Co, for dependable service! While we specialize in light and medium duty towing, we're always here for your roadside assistance needs. Our services include car unlocks, tire changes, fuel delivery and jump-starts. Don't wait another moment. Give us a call and we'll be on our way. Your safety is important to us -- we don't want you wondering how you will get home after a collision or fender bender. Leave it to us! For residents in and beyond Greeneville, MO we are here for you! We service Wayne County and the surrounding areas with a 45-60 minute response time!